Last year I posted some of my most interesting finds from the June 18 Berkshire BioBlitz on Mt. Greylock—at least, the ones that were most immediately visually interesting. There were several more significant discoveries that I didn’t want to write about until I had the whole story. One was this nondescript green sawfly larva that Julia noticed on a beech leaf, right near the one on an oak leaf that was busy getting parasitized by ichneumonids. I sent it to Dave, and he identified it as Nematus appalachia (Tenthredinidae), a species he had described just 12 years earlier from adults caught in Malaise traps in the Appalachians of North Carolina, Tennessee, and West Virginia. So this one found on a mountain in Massachusetts represented a pretty dramatic expansion of the species’ known range as well as the discovery of its host plant. We reported all this in a short paper that was just published a few days ago*. I’ve sent these specimens off to Germany, Denmark, and Canada, where my taxonomist collaborators are working on describing them. I’ll have more to say about these species once their names have been properly published, hopefully within the next year. I was thinking about saying something here about how odd it is that I have to send most of my bugs outside the US to get them identified, and musing about how this might relate to the fact that it’s so hard to get permission to collect in this country in the first place… but instead I’d just like to commend the owners and managers of natural areas out there who encourage nature study rather than forbidding it. * Smith, David R., Julia A. Blyth, and Charles S. Eiseman. 2017. Nematus appalachia Smith (Hymenoptera: Tenthredinidae) feeding on Fagus grandifolia (Fagaceae). Proceedings of the Entomological Society of Washington 119(3):518-519. This entry was posted in Uncategorized and tagged Agromyzidae, beech, Berkshire BioBlitz, Fagaceae, Fagus grandifolia, larva, Nematus, Nematus appalachia, new species, Platygastridae, sawfly, Sciaridae, Tenthredinidae. Bookmark the permalink. You can come here anytime. Seriously. Definitely the world of insects continues to be confusing and full of unknowns. 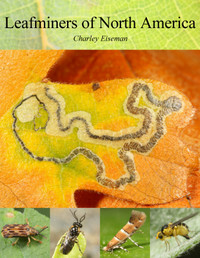 Charley, I have reared a small number of wasps and moths from various leaf mines and galls, all now preserved in alcohol. They will need to be sent out for id. Could you contact me personally for advice on how to do this and who to contact? I’m in eastern Canada, and I have access to the federal Canadian Forest Service insect collection as well as a contact at the New Brunswick Museum. Many thanks. My bugs are your bugs. See you soon! In our country, perhaps there is little enthusiasm due to harsh government responses that leave people fearful of what you might find there? No landowner wants ginormous fines and jail terms, loss of land or use of land, etc. That would explain why some private landowners don’t want any biologists going on their land, but not why collecting wouldn’t be allowed when federal and state governments are the landowners. Incidentally, my state (Massachusetts) has some of the strictest rare species laws in the country, and I’ve never heard of anyone getting fined, jail time, or land lost due to rare species being found on their property. Some restrictions may be placed on their use of the land, yes, but very rarely is a proposed project outright blocked because of rare species. A lot of the paranoia around here is the result of a smear campaign against Natural Heritage by a newspaper editor who had a vendetta because he wasn’t allowed to build a house in the exact spot (rare turtle habitat) he wanted to. I keep finding more sawflies. Last they were on a poplar. This year they were eating my red current bush. I’ve had them on mountain ash too. So that’s three species.here in Halifax NS. I live in Colrain with well over a hundred acres and I would welcome any biologist wanting to do any kind of survey. BTW I wrote to you this summer with a question about cecropias eating beech. I did not hear from you but would love to know if cecropias do eat beech. I may have to take you up on that at some point! I lived in Colrain for a year and I know there are a lot of interesting plants there. I just searched my email account for your email address and didn’t find any message from you, but yes, beech is one of the many host plants recorded for cecropias–check out this database. 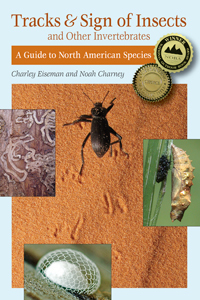 If I remember correctly, the cecropia cocoon shown in my book was wrapped in beech leaves. You’re welcome to our place anytime. Bryant hill in Cummington. Stellar photos, Charley!